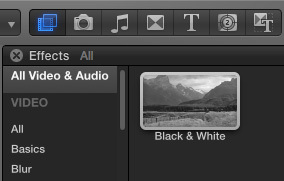 No… but you can’t create an FCP X effect using After Effects. Great tip! Just following up on the downloadable adjustment layer. Would love to use this approach but do not own Motion. Any chance a downloadable adjustment layer was made available? Thanks! Great trick I see it as useful for applying an effect to multiple clips (as in your example). Unless I am doing something wrong, it seems that there is a big (IMO) limitation to this workaround. 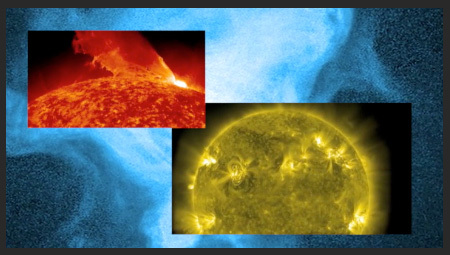 The compositing tools do not work. Compositing mode has no effect at all and opacity simply fades everything down to nothing. It would be nice to have true adjustment layers where mode and opacity can be changed. Is there any workaround to achieve this functionality? Because the “adjustment layer” is just a setting, there is nothing for the blend modes or opacity to work on, as they need video in the clip to which they are applied. For those two effects, you are better off using a compound clip. I have just updated my OS to El Capitan and am running the latest FCPX. 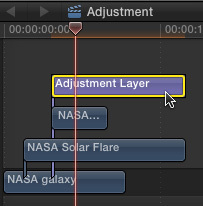 I have an adjustment layer folder ready to install (as per Nathan Veers downloadable link) but for some reason i can’t get the effect to show up in my Titles browser with FCPX. I have tried saving to: movies>motion templates>titles but this hasn’t worked. The motion file is definitely inside the folder… Any suggestions? You probably need to put the folder containing the Adjustment Layer in a category folder inside Titles. 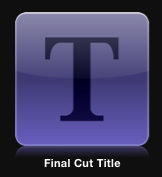 Thusly: Motion Templates > Titles > Vishal > Adjustment Layer folder. 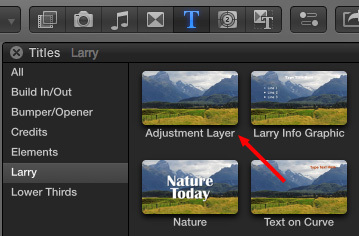 Or, simply create a new adjustment layer in Motion as this article describes. When you save it, Motion will put it in the right place. The layer is created as described in Motion. I then find it in FCPX and move it onto my timeline above a clip, but all I get is a red background showing a letter T and an exclamation mark in a yellow triangle. Mike, make sure you are creating a drop zone, not adding media. The red box indicates missing media that is associated with the Motion project. I have exactly the same problem as Mike. I tried to create one myself in motion and tried a downloaded one and the problem is always there. I don’t understand what you mean with “creating a drop zone, not adding media”. Can describe it more precisely? A drop zone, in Motion, is a placeholder object that you create, modify and/or animate in Motion, then, when the template is added to Final Cut, you can add video to the drop zone that applies all those Motion settings to the clip in FCP X. 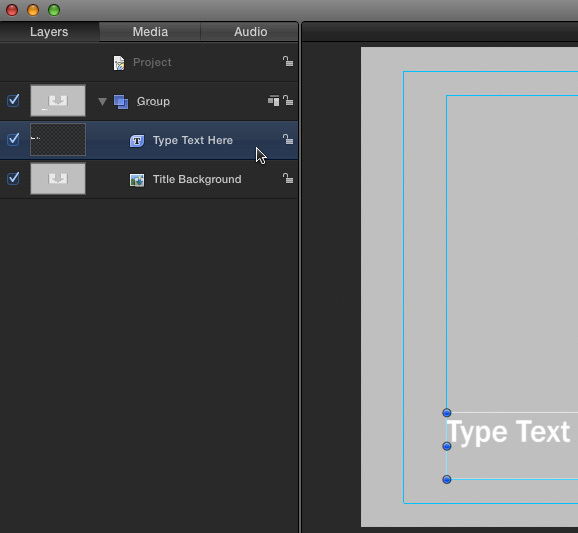 In the case of this adjustment layer, by starting with a Title template in Motion (and Motion is the ONLY place this can be created) the drop zone that you need for this effect is already applied. This means that you don’t need to add or modify anything – except to remove the text block that is displayed on top of the drop zone in Motion. 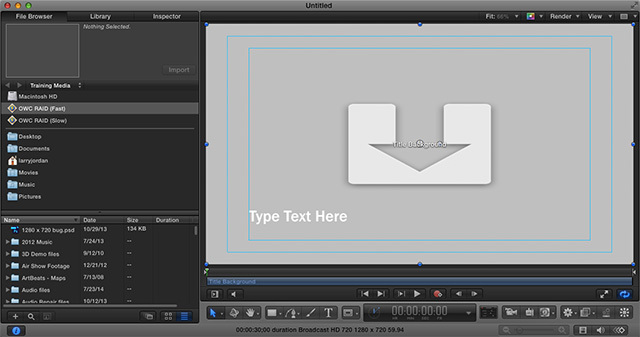 Now, when you save this template from Motion into Final Cut – as the article illustrates – that drop zone travels with it. By adding this template above any existing clips, any effects applied to the template will affect all the video in layers underneath it. Thanks Larry. I’ve been using adjustment layers since this post…. There are times (such as when a scene fades to black or a cross fade between scenes) when I need to adjustment layer to fade as well. Adjustment layers do not seem to fade. Whether I keyframe the opacity, or add a cross fade, it’s either at 100% or off. How can I get one adjustment later to transition into another? Good question – I don’t know. Perhaps another reader can suggest a workaround. Thanks Larry. It’ll be interesting to hear the feedback. On another note (and let me know if there’s a better place to post this) I have some bad VLOG footage from a GH4. It’s quite underexposed. 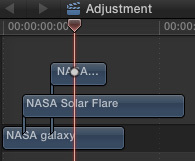 In FCPx, I raised the global exposure by 15% to get it in the same universe as other (better exposed) stuff. As a result, the colors are now a mess. I’ve watched your color correcting video, but I’m still having trouble making the footage look decent. 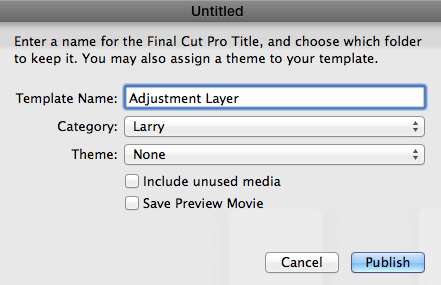 This article was written to explain how to create your own adjustment layer. Other sites, such as Rampant Design Tools, are providing downloads. A question related to the last part of your post… a broadcast safe filter makes all legal. I notice when adding the sharpen effect, this also puts the histogram within 0-100. I presume my looking at the histogram and seeing everything within the scopes means its legal already after using the sharpen tool. Is this correct? Or is there something deeper that I am missing? There’s something deeper. I am not sure the Histogram shows the same values as the Waveform Monitor. Also, broadcast safe for Rec. 601 video is not the same as Rec. 709 video. For these reasons, I don’t trust the Histogram, but I do trust the Waveform Monitor.